‘Album’ fall blooming hardy cyclamen, C. hederifolium ‘Album’, has white flowers, shown here blooming before the leaves on September 28, 2011, and spreads to form a ground cover that stays green through the winter. In my article Flowering Wintergreen Ground Covers for Shade, I explained that I treasure evergreen ground covers that are presentable through winter because, here in the mid-Atlantic (US), we go through long periods of winter weather that are just plain cold without the compensation or covering of snow when any patch of green is prized. 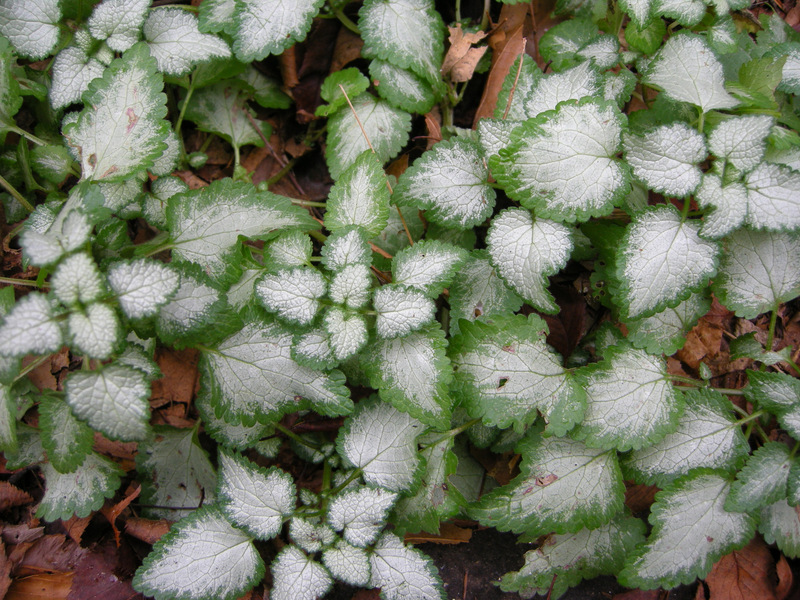 Ground covers, especially those that maintain a presence through winter, make a garden look mature and cut down on the labor of weeding and the expense of mulch. 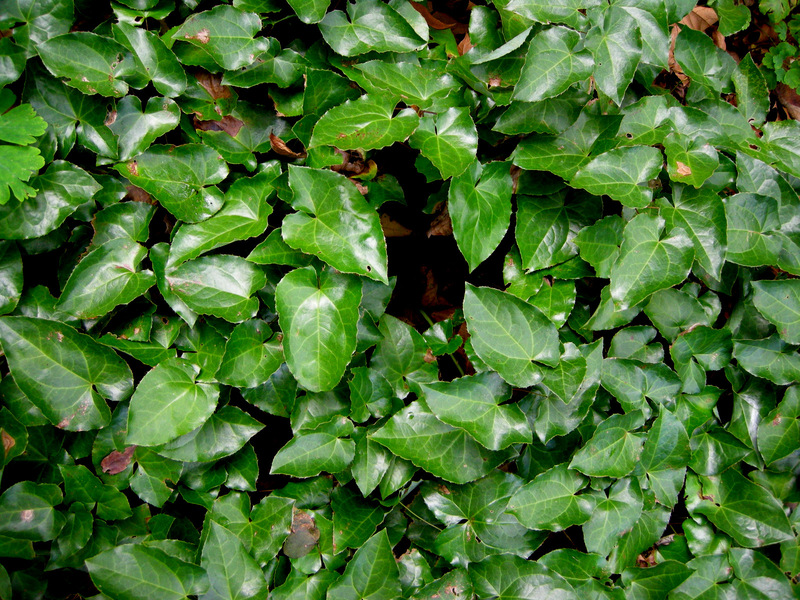 Yes, you can plant the evergreen triumvirate of vinca, ivy, and pachysandra. But I want more: beautiful flowers and foliage too. Just like the four in my original article, all four of the shady ground covers described below have prominent places at Carolyn’s Shade Gardens. ‘Shell Pink’ spotted dead nettle (I prefer to call it lamium), Lamium maculatum ‘Shell Pink’, still blooming at the end of November 2010. 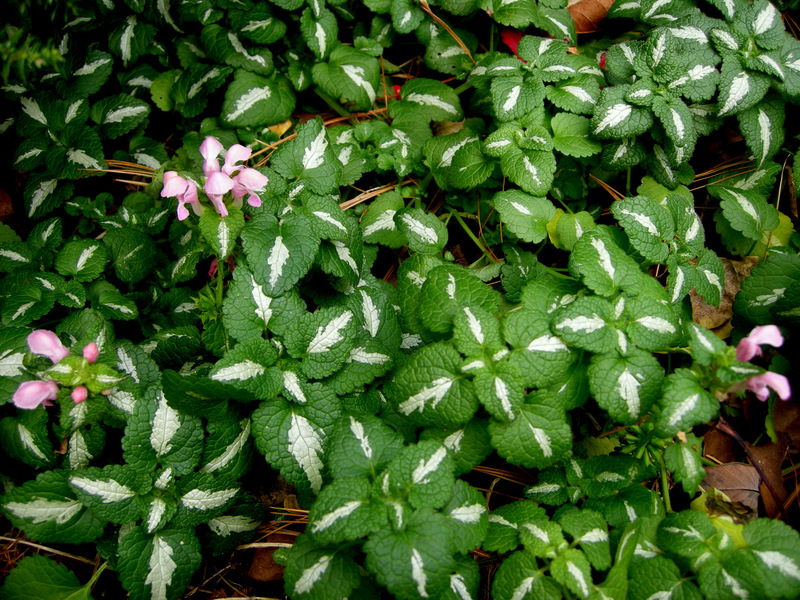 Lamium ‘Shell Pink’ is a versatile wintergreen ground cover with gorgeous flowers from April to November. It is the only lamium cultivar that blooms this long–all the others have a season of bloom in the spring. I grow mine under the shade of a white pine (photo above and below) and also in a sunny area in front of my peonies. 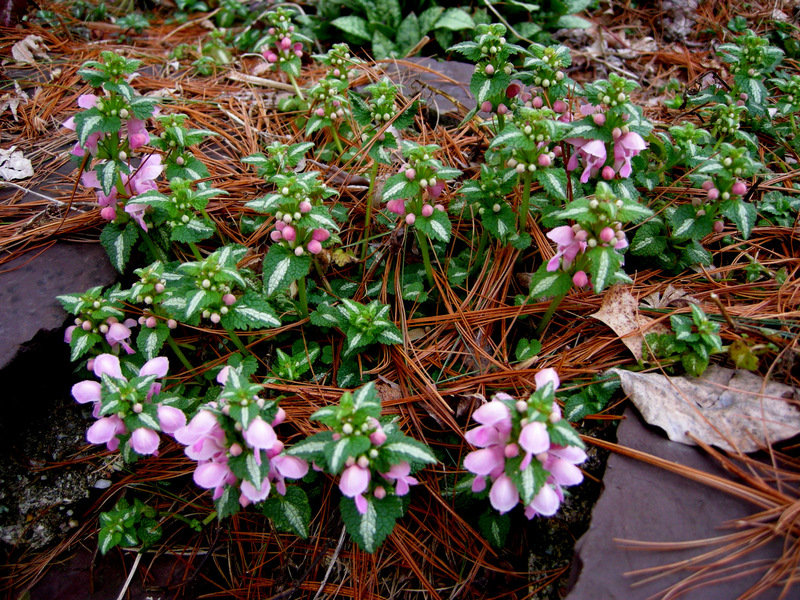 ‘Shell Pink’s’ leaves stay neat and tidy all winter. The first flush of blooms on ‘Shell Pink’ lamium in early April 2011. Lamium maculatum is native to Europe and temperate Asia. It quickly creeps to form 4 to 8″ tall patches of wintergreen leaves even in open full shade in zones 3 to 8. It doesn’t seem to care if the soil is moist or dry but likes to be well-drained. On ‘Shell Pink’, the first flush of flower buds emerges in early April to be followed by successive waves of blooms into November. It fills in around surrounding plants without overwhelming them. My deer have never touched it. Lamium also makes a great container plant and overwinters outside in pots. The only other cultivar I recommend is ‘Purple Dragon’ with bright purple flowers and solid silver leaves (photo below). Although ‘Purple Dragon’ lamium only blooms in the spring, it’s silver leaves are quite ornamental in their own right. Photo December 2010. In anticipation of comments telling me that lamium is “invasive”, let me say three things. First, it is a ground cover so it is supposed to spread and cover large areas. A plant isn’t invasive because it spreads too much—the gardener has just planted it in the wrong place. To me, it’s invasive if you can’t remove it when you want to either because you can never get it all (goutweed, lesser celandine) or it seeds so prolifically that you can’t remove all the seedlings (garlic mustard). Second, the straight species, Lamium maculatum, may be invasive so don’t plant it. Third, many times when gardeners say this they are talking about yellow archangel, Lamiastrum galeobdolon, a plant with yellow flowers and silver leaves that is invasive. Lamiums don’t have yellow flowers. Thanks for listening! Fall-blooming hardy cyclamen, C. hederifolium, in full bloom in late October 2010. 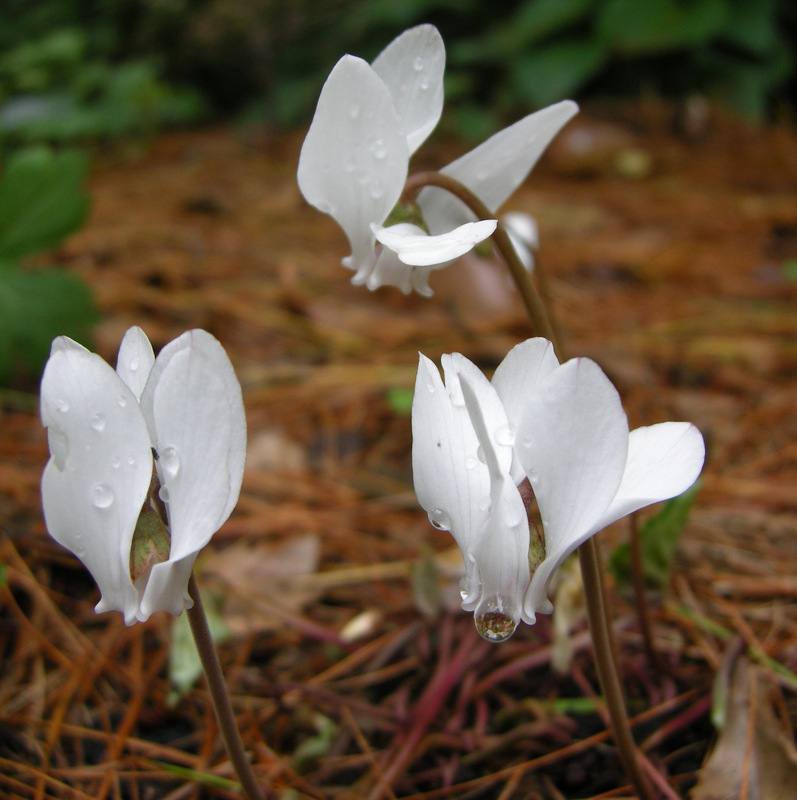 Although spring-blooming hardy cyclamen, C. coum, is finicky and hard to grow, fall-blooming hardy cyclamen will thrive in most shady locations as long as it is well-drained. The flowers start to bloom in September and October before the leaves break dormancy. Then its gorgeous, intricately patterned wintergreen leaves emerge and remain pristine all winter until they go dormant in early summer. Mine happily naturalize in east-facing shady locations. Imagine large patches of this fall-blooming hardy cyclamen foliage all through winter–absolutely stunning! Photo in late November 2010. 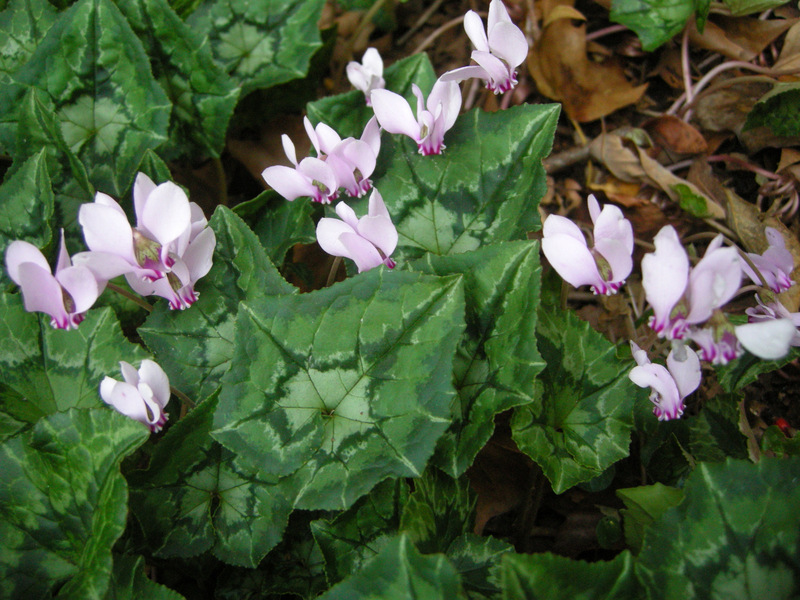 Hardy cyclamen is native to wooded areas and rocky hillsides of southern Europe and Turkey. 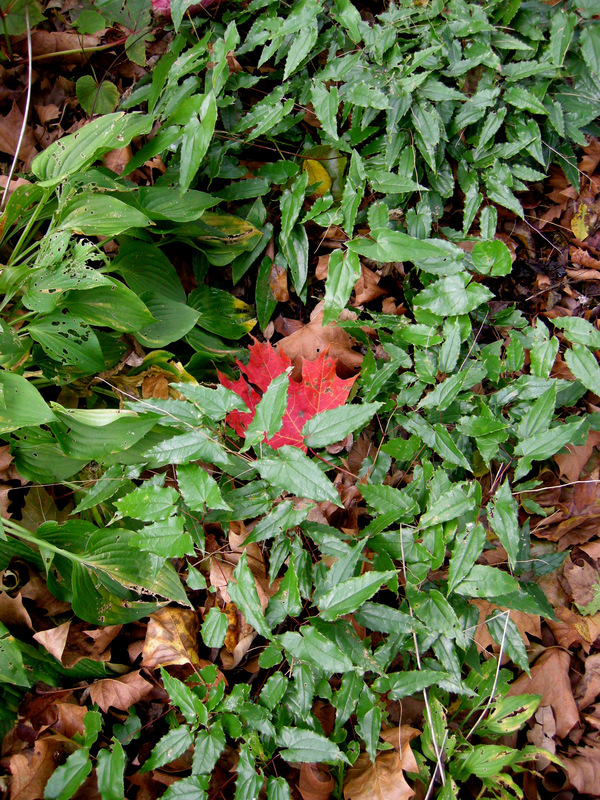 It forms 4 to 6″ tall mats of leaves, which remain highly ornamental through winter in zones 5 to 9. It is very tolerant of soil conditions as long as it is well-drained and, once established, grows well in full dry shade. My deer leave it alone. ‘Pictum’ Italian arum, Arum italicum ‘Pictum’, used as a ground cover around hellebores and hostas along my front walk so I can admire it all winter. Photo October 20, 2011. 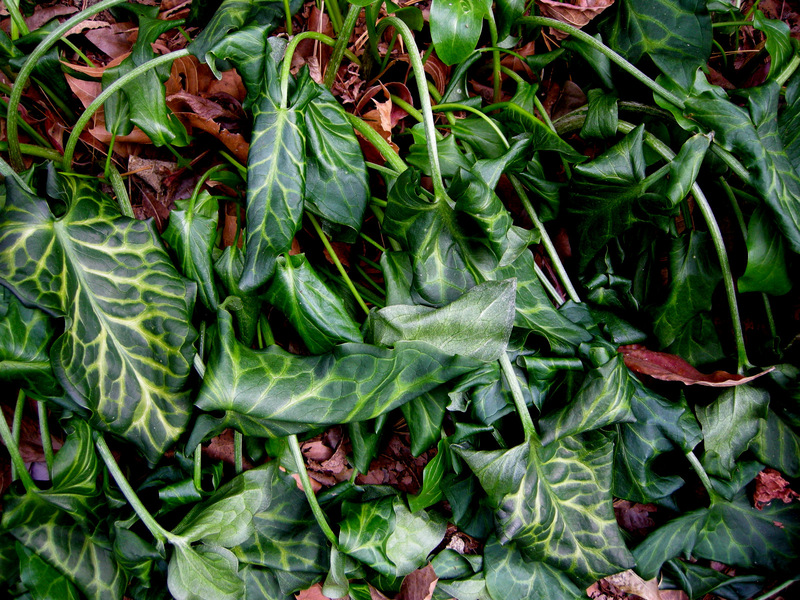 This is what happens to Italian arum during really cold weather. No matter how many times I have witnessed it, I am always amazed when it stands back up and looks as if nothing has happened. Photo December 2010. I have featured Italian arum photos on my blog many times but that’s because I think it is such a great plant. The leaves emerge in September and remain immaculate through the winter. If the weather is really cold, it wilts to the ground (see photo above), only to perk up again as soon as temperatures recover. I have it planted by my front walk so I can enjoy its spotless, highly ornamental leaves all winter. I also use it to cover areas where I cut back ratty hostas in the fall (see my article Hostas for Fall). In May and June, it blooms with a pale green hood-like spathe covering a yellow spadix like our native jack-in-the-pulpit. Bright orange berries appear in summer. Several wonderful cultivars are available, including ‘Gold Rush’, which emerges in the spring with golden venation, and ‘Tiny Tot’, a miniature. ‘Gold Rush’ Italian arum in November 2010. 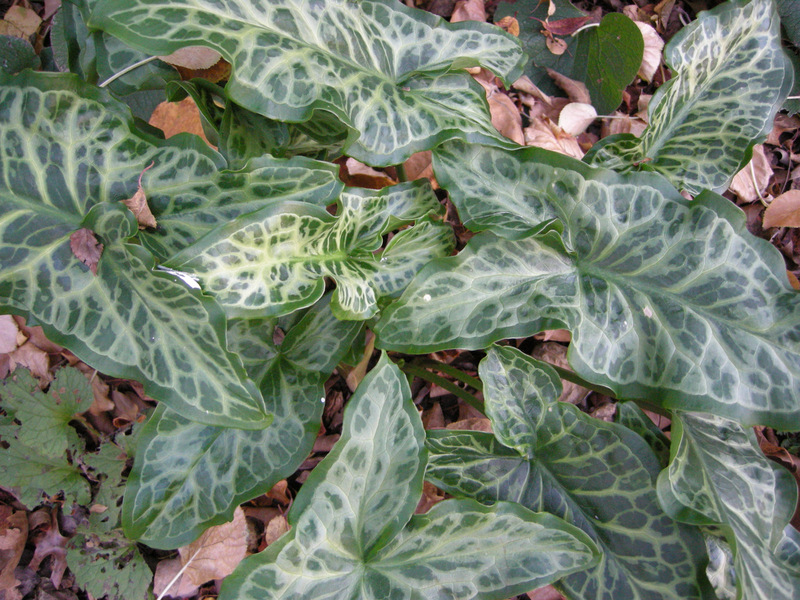 Italian arum cultivars have superior markings. ‘Tiny Tot’ Italian arum in February of 2009. Italian arum is native to Europe. It grows 12 to 18″ tall in zones 6 to 9. It thrives in any soil in almost full sun to full shade and is tolerant of drought. Deer do not bother it. In the 20 years that I have been growing it, it has spread politely to other areas of my garden, but occasionally I have heard that it can become an aggressive spreader. Lyn from The Amateur Weeder reports that it is invasive in Australia. Please consult local experts to see if there is a problem where you garden. ‘Sulphureum’ epimedium, E. x versicolor ‘Sulphureum’, used as a ground cover in front of hardy begonia, B. grandis. Photo October 20, 2011. I love epimediums. In fact, I love them so much that they are one of the few plants I allow myself to collect with 30 varieties in my garden. Their small but copious spring flowers are beautiful and unusual coming in white, pink, yellow, orange, red, purple, and bicolors. I also prize their leaves which are often shiny and wing-shaped, sporting spiky edges or colored splotches or lovely venation. Many epimediums are deciduous and clump-forming. 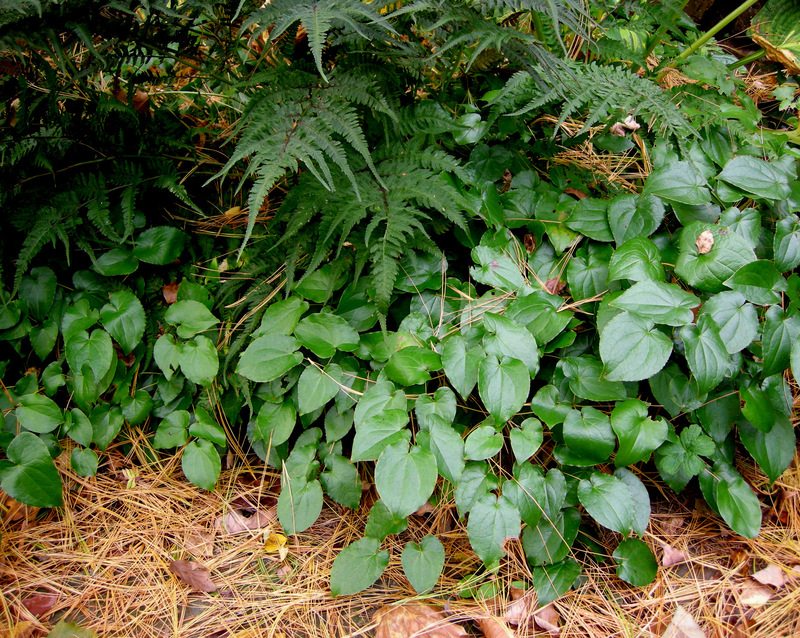 In this article, I want to profile a few that have wintergreen leaves and spread to make a ground cover. The fastest growing epimedium by far is ‘Sulphureum’. It spreads at a medium rate to form a large patch (see photo above). Its two-tone yellow flowers look like miniature daffodils in early April. E. x rubrum is the second fastest spreader. It’s leaves are similar to ‘Sulphureum’. If you can find the cultivar ‘Sweetheart’, pictured above, it has gorgeous flowers. 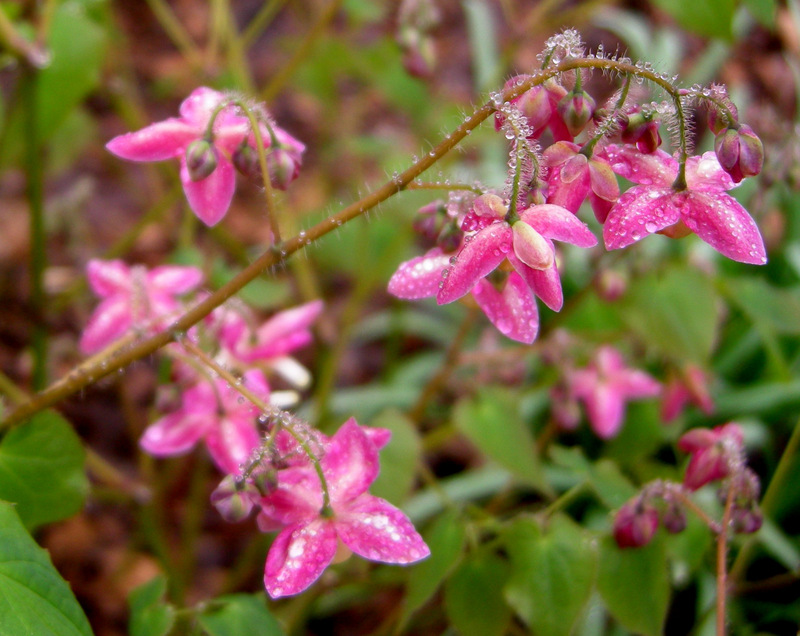 I sell a good selection of epimediums at my nursery, but I get my unusual epimediums from the Massachusetts nursery, Garden Vision Epimediums (email epimediums@earthlink.net). They have hundreds of varieties. ‘Frohnleiten’ epimedium, E. x perralchicum ‘Frohnleiten’, is also a fairly quick spreader . It has gorgeous shiny leaves with an intricate vein pattern and produces bright, sulfur yellow flowers in the spring. ‘Shrimp Girl’ epimedium, E. alpinum ‘Shrimp Girl’, is also a good spreader in my garden, here used as a ground cover in front of ferns and hostas. The lovely two-tone flowers of ‘Shrimp Girl’ in spring. I am including ‘Kaguyahime’ epimedium even though it spreads fairly slowly so that you can see how beautiful and unusual the leaves of wintergreen epimediums can be. Epimediums are native to Europe, Asia, and North Africa. They reach 6 to 12″ tall, depending on the cultivar, and flower in April. They grow in part to full shade and can take dry soil once established. Their creeping roots are impenetrable to weeds. I cut back all the remaining old foliage in March once I see the new flowers and leaves starting to emerge. 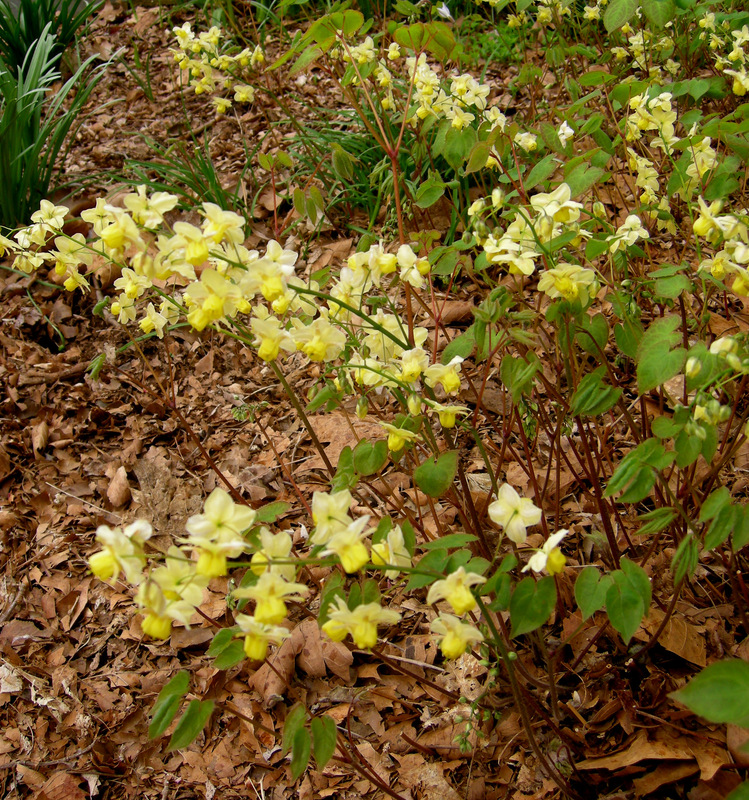 When choosing an epimedium for ground cover, select spreading varieties that have evergreen or semi-evergreen leaves. Next spring when you are looking for ground covers, I hope you will consider one of the four described above. 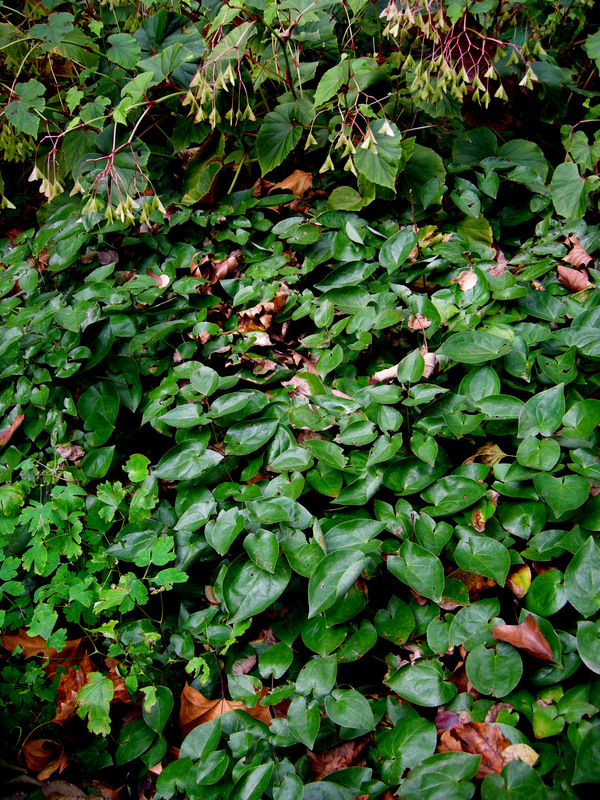 In the meantime, leave a comment with the name of your favorite wintergreen ground cover for shade. In my first article, I profiled golden groundsel, creeping phlox, dwarf sweetbox, and hybrid hellebores as ground covers. If you want to read about them, click here. This entry was posted on October 27, 2011 at 12:05 pm and is filed under evergreen, Fall, groundcover, Shade Perennials, winter interest with tags Arum italicum 'Gold Rush', Arum italicum 'Tiny Tot', Cyclamen hederifolium, Epimedium alpinum 'Shrimp Girl', Epimedium x 'Kaguyahime', Epimedium x perralchicum 'Frohnleiten', Epimedium x rubrum 'Sweetheart', Epimedium x versicolor 'Sulphureum', epimediums, evergreen groundcovers for shade, hardy cyclamen, Italian arum, lamium 'Shell Pink'. You can follow any responses to this entry through the RSS 2.0 feed. You can leave a response, or trackback from your own site. I also love epimediums. But they don’t like me that much. I have tried many but now I only have one Epimedium pauciflorum left. 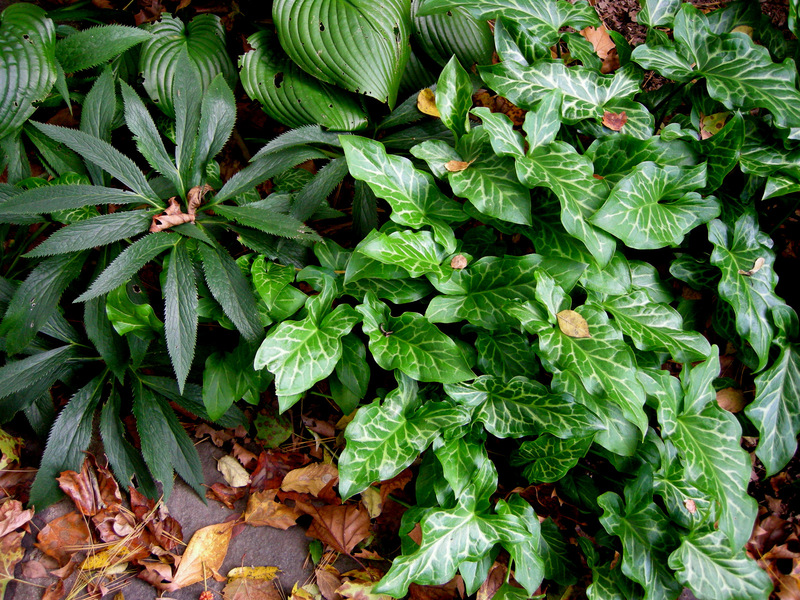 Other groundcovers like Pachysandra, Ophiopogon and Asarum do much better in my dry shady garden. Carolyn, I love lamium for their lovely foliage and gorgeous flowers. i don;t find them invasive but great ground covers. their early blooms are appreciated by pollinators. Cyclamen is a fav of mine under my trees in the back. The unfurling of the flowers is fun to watch and the foliage is not to be missed. It is what I will focus on once we get our overnight freeze since all the flowers will die back. But epimediums are my secret passion. I have many different ones scattered throughout the shady spots and their delicate flowers are a wonderful show every spring. I hope to collect more. Another great post Carolyn, and thank you, I think I now understand why I keep losing my supposedly hardy cyclamen, not enough drainage. Very hard to pick a favourite but Epimedium ‘Sulphureum’ has just leapt on to my wishlist, such pretty flowers. Great article!!! You did a terrific job of explaining Lamium and how to tell invasive plants. After many years, our patch of Epimedium warleylense is large enough to cut very, very early with a lawnmower. One has to be brave. Great groundcovers. I so love empimediums. They are beautiful! Any and all of the above can put the “lawn” mower on standby duty! As for invasiveness, that mower and the weed whacker still have a spot in the garden shed. . .
Good and informative post as always. Ground covers are always invaluable in garden design and well planned landscapes. Gosh, I didn’t realize from your title that the first lovely image to greet me would be the Cyclamen. It took my breath away! I really must plant some hardy Cyclamen! The Italian Arum is a magical plant–I had no idea! Another one to add to the list. Thanks, Carolyn! Super post about my favourite part of the garden…the shade. 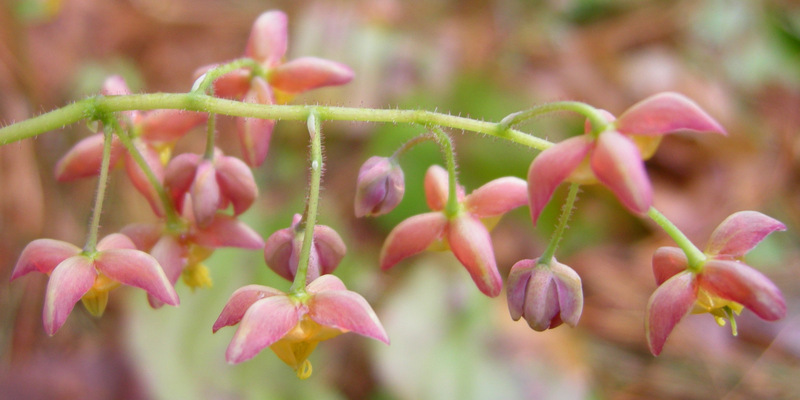 I’m another epimedium addict, will have to add your Shrimp Girl to my wish list. Wouldn’t be without Lamiastrum galeobdolon in a very dry corner of the woodland, looks fantastic when in flower and the rest of the year it stops the weeds. Never realised there were so many different varieties of Arum italicum pictum, which we have plenty of alongside all the lovely cyclamen. Thanks for all the information you give us. Carolyn – I love lamiums too, they can invade as much as they like. Are wintergreens a special group of evergreens ? I remember the first time I saw white flowering cyclamen and being blown away – they were so gorgeous! I had previously thought that it only came in pink. I need to get some for my garden! The lamium looks so pretty too! Sadly, most of my yard is the opposite of ‘well draining’. As always, you have several of my favorites here!! I’m working on creating some shade just so I can grow some of these beauties. So far the deer have ignored my Epimedium rubrum (I’ve added suplhureum to my wish list – forgotten about that one) but I wonder if they are partial to cyclamen. Any idea? Glad to hear your thoughts on Lamium Carolyn. I inherited one with the house and it has pink flowers and shiny silver foliage. Spreads but not too rapidly so I’ve been quite pleased with it. Another great post full of good information! I have been thinking about hardy cyclamen for a while. You have convinced me – you know how susceptible to suggestion I am! I also love epimediums. I have had them in my garden only a couple of year. I have only a couple of varieties, and already they are among my favorites. Carolyn, my favourites would be hellebores and cyclamens, but I will have to wait to use themuntil the project of my garden gets real (it has been a little delayed). meanwhile I managed to keep two cyclamens from last year in my terrace despite the snow storms in Brussels, I hope they bring me color this fall again, cyclamens are so elegant! Your epimediums are lovely. Like many gardeners, I guess, I’m starting to notice these plants more often. I’d like to try ‘Alabaster’ eventually. As my trees grow I’ll have more dry shade for epimediums. Sorry, but I really just work with shady areas.